Although he's lowered himself somewhat in my estimation by being part of one of the most overrated bands ever, the oddly creepy Buckethead (or Brian Patrick Carroll to his parents) has produced some excellent work amidst his twenty-eight solo albums and various collaborations. The latter includes appearances on the albums of everyone from Mike Patton to Viggo Mortensen (yes, Aragorn from the Lord Of The Rings films) yet it's this album that I find to be up there with his best. I've never been too keen on guitarists making solo albums - all too often it's the sort of show-off nonsense that speaks of nothing but egos allowed to run roughshod over common sense, but when the result is an actual album full of songs, as here, then things get interesting. 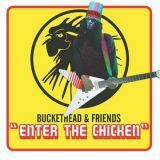 Enter The Chicken features a range of vocalists, differing from track to track, but Buckethead's main partner here is Serj Tankian, better known as System Of A Down's vocalist - it's on his label, he produced it, and he appears on three tracks. This can get slightly annoying, as there are times when it veers dangerously close to an SOAD b-sides collection, but there's just enough variety overall to make this less of a problem. First track proper and single We Are One, however, is like a heavier System Of A Down, technical downtuned guitar riffs interweaving with Tankian's odd vocals before turning melodic, a nice bit of soloing from ol' Bucket foreshadowing a complete mental breakdown from Serj. It gets weirder, turning almost completely Avant-Garde before switching back to melody with a nice epic vocal performance, and remains one of the best songs on the album, rather overshadowing the following Botnus, featuring Efrem Schulz of Death By Stereo (no, I've never heard of them either). His frenzied yelps give the track a metalcore-ish feel, not really helping matters, and the album takes an experimental turn with Three Fingers, featuring vocals from Saul Williams. For the verses he speaks the lyrics, backed only by beats and electronic sounds, although there is plenty of guitar as well. It's actually enjoyably catchy once you're used to its jarring appearance in the tracklisting, although it might take a few listens to realise it. This song heralds a change in the album, the following tracks moving away from Metal as Running From The Light features dual female vocals from Maura Davis (Denali) and popular Ethiopian singer Gigi. There are guitars backing them, but the main focus is on the vocals, and well, it's a beautiful track, but a long way from the technical heaviness of earlier. Coma is similarly gorgeous, featuring Iranian siren Azam Ali in a distinctly later The Gathering style, experimental electronica-enhanced rock, and whilst Serj pops up partway through, it's hard not to wish that Azam was left to perform on her own as, no disrespect to Serj, but he really adds little here. He's absent from most of the track, however, and the music takes a pleasantly cinematic turn towards the end which helps make it another highlight. From then on, there's a slight dip in quality, but only a slight one. I find Shana Halligan's odd-sounding voice a bit of a distraction from the otherwise good Alt-Rock of Waiting Hare, and whilst Funbus, starting as some sort of Death Metal and moving towards Avant-Garde territory, has plenty of great playing from Buckethead the vocals are spoilt by a preachy spoken section from Serj about how wonderful and artistic music can be. The operatic/orgasmic female backing of the riff-heavy The Hand are great, but Maximum Bob's wacky vocal contribution verges on annoying; call me undecided on that, but I'm certainly not undecided about closing instrumental Nottingham Lace. It's a great piece of guitarmanship, kicking off with catchy Metal groove before taking a more atmospheric turn, moving through impressive funkiness and ominous sludge before shooting off into melodic soloing; certainly, I'd love more of this rather than some of the tracks that sound like something Serj couldn't get on the last SOAD album, but that's what other Buckethead albums are for, I suppose. I've reviewed this looking at the songs as songs rather than examples of Buckethead's riffage skills, so fans of Metal instrumental guitar albums will be distinctly less pleased with the relatively little heaviness to be found. As an example of how his playing can be applied to a range of musical styles, however, Enter The Chicken is little short of excellent - slightly jarring switches from heaviness to lightness being the one real criticism that can be made. It doesn't work perfectly as an album, but as a collection of songs this is excellent, a great place to start with Buckethead's massive discography due to the variety shown, and listener-friendly vocalist selections. Closing the album with Nottingham Lace works wonders, as it leaves you in want of more instrumental wizardry - a cue to check his other albums out, something certainly recommended.